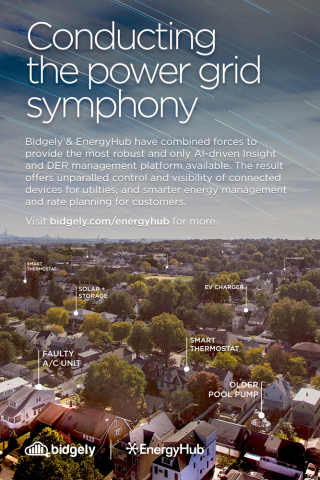 NEW YORK & MOUNTAIN VIEW, Calif.--(BUSINESS WIRE)--EnergyHub and Bidgely have partnered to deliver an integrated solution that combines EnergyHub’s Mercury distributed energy resource management system (DERMS), connected device ecosystem and customer lifecycle tools with Bidgely’s artificial intelligence home energy management (HEM) platform and Insights Engine. The linked platforms bring utilities the best customer engagement, energy efficiency and load-shaping solution. For more information on the Bidgely and EnergyHub partnership, visit: https://bidgely.com/energyhub/.